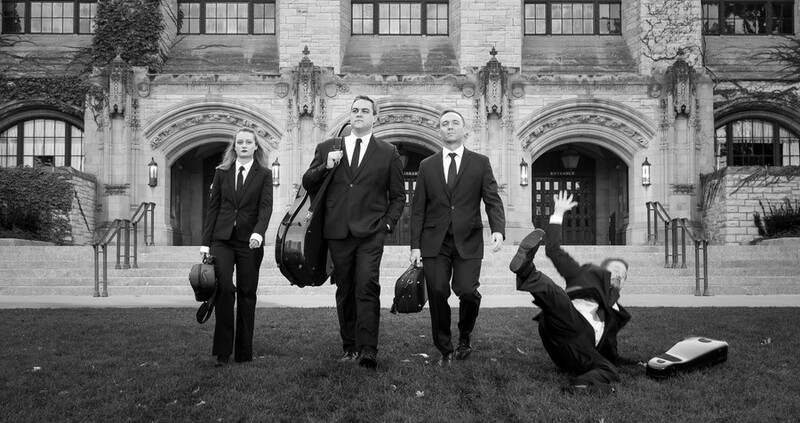 Not your grandparents’ string quartet: the Spektral Quartet— Clara Lyon (violin), Russell Rolen (cello), Austin Wulliman (violin), and Doyle Armbrust (viola)—hope to tickle eardrums and funny bones alike with their new CD, Serious Business. There are very few parallels to be drawn between the classical concert hall and the comedy club—that is, until now. The Chicago-based Spektral Quartet’s newest album, Serious Business, has finally found a way to make classical music laugh-out-loud funny. The album features four humorous tracks that span centuries; three are world premieres written within the last two years while the final track is by 18th-century composer Joseph Haydn. Yet all four pieces were written with humor in mind. Chicago-based performer Chris Fisher-Lochhead’s “Hack,” the inspiration for the album, captures the pitch, cadence, and harmonic content of the voices of such comedians as Sarah Silverman, Dave Chappelle, and Robin Williams. Though “Hack” was the catalyst for Serious Business, the quartet soon realized that two of their other commissions—David Reminick’s “The Ancestral Mousetrap” and Sky Macklay’s “Many Many Cadences”—were also riddled with humor. “The Ancestral Mousetrap” features the macabre poetry of Russell Edson as the libretto, with all four members of the ensemble singing in harmony against their own instrumental lines. Like the work of all great comedians, the humor in Reminick’s piece proved to be thought-provoking for listeners and musicians alike. The third new piece on the album, “Many Many Cadences,” moves at a breakneck tempo: the piece consists entirely of the conclusion of cadences from the top range of the quartet in a rhythmic frenzy. “We played this for a fairly traditional audience at Fermilab…and had the over-60 segment of the crowd cackling,” Armbrust said. “That’s a 250-year-old joke that still kills,” Armbrust said. Spektral’s album may be entitled Serious Business, but in actuality it encompasses anything but the austere classical stereotype. Filled with music that is new and old, classical and comedic, it is boundary-defying in every way. The Spektral Quartet will celebrate the new album with release parties at Maynes Stage on Friday, January 29 at 8 p.m. and at the Logan Center on Sunday, January 31 at 3 p.m.